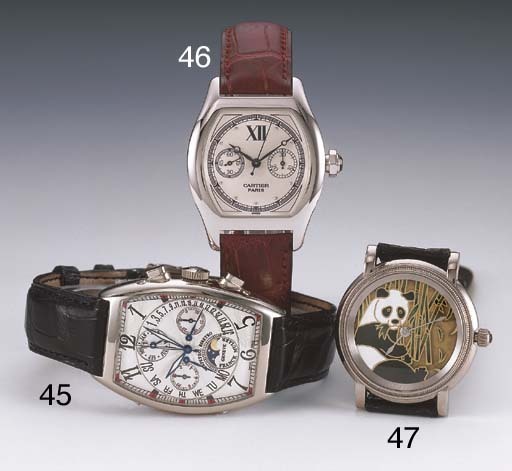 SIGNED CARTIER, PARIS, PRIVATE COLLECTION TORTUE, NO. 0082, RECENT. Rhodium finished 22-jewel mechanical movement, white dial with Roman 12, subsidiary constant seconds, minute recording dial, blued steel moon hands, Tortue case with glazed back secured by eight screws, winding crown acting as the pusher set with facetted sapphire endstone, maker's strap and 18ct white gold deplayant clasp, dial, case and movement signed. This lot is sold with Cartier Collection Privee fitted box, outer packaging and papers as well as a second fitted hardwood box containing a loupe, carrying pouch and polishing cloth.